In July 1983 Dr. Ariel Andersen, organizer of the Foundation, passed on. He had dedicated the last 14 years of his life managing the Foundation as a volunteer. 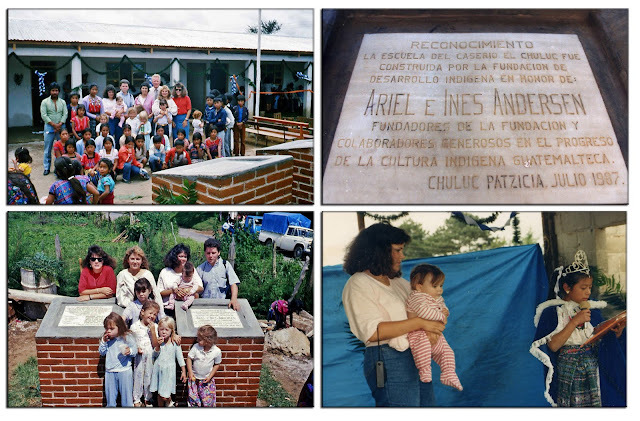 In October 1986 at the funeral for his wife, Ines, it was decided to ask for donations to fund a project in their honor in Guatemala. $20,000 was raised for the project. Quite a few of the Andersen's were at the inauguration of the in July 1987 as you can see above around the brick structures where marble plaques were installed: One giving credit to the Foundation and the Municipal government for the construction; The other giving honor to Ariel and Ines Andersen as the founders of the Foundation and generous collaborators in improving the Indigenous cultural in Guatemala. A year later, in 1988, Foundation trustee, J. Frederick "Toby" Pingree, visited the school and was favorably impressed with the progress being made. By that time the marble plaques each had their own little thatch roof, and the foundation was being laid for a cement block wall around the school. 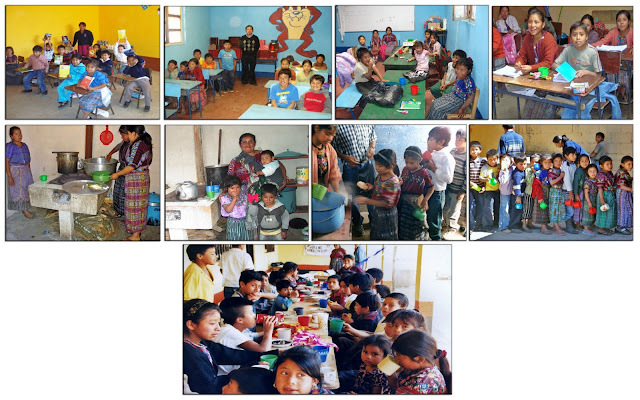 The Foundation has continued over all these years giving support to the school, paying the salary of one of the teachers, and providing the daily nutrition program, in addition to aiding the village in many ways over the years, including providing emergency medical services. 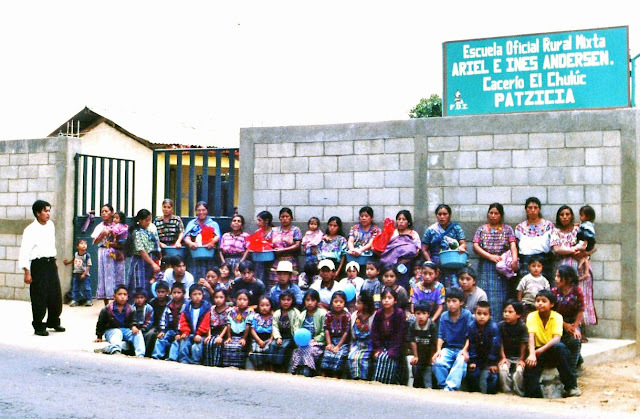 In 2004 the school was struck with an epidemic caused by contaminated water. 30 of the children, you see above, were affected and treated with antibiotics provided by the Foundation. 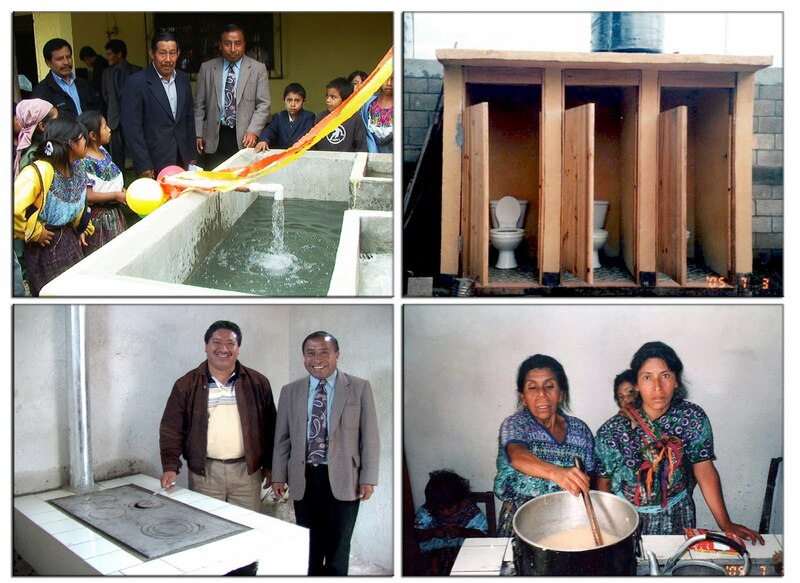 In 2005 it was decided to create a safe potable water system for the school. To pave the way electric installation was achieved in the whole village. Then Indian experts with short handled hoes and shovels were contracted to dig by hand a well that ended up being 55 meters deep. A submersible pump was installed to pump water to a storage tank, that was installed on top of the 2nd phase of the project--a new sanitary facility with the first and only flush toilets in the village, complete with septic system. NOTE: In the well picture do you see the little white dot? That is the water 55 meters down. The 3rd phase was the construction of a cement pila with water storage, where hands and dishes can be safely washed, seen below, also below you see the doors on the rest rooms that were not forgotten. The 4th phase was the renovation of the kitchen which had been broken into by thieves who stole the cast iron top of the wood stove, and the kitchen utensils used for the daily nutrition program. A steel door was installed to secure the new facility, including new pots and utensils for the daily nutrition program. Above admiring the new stove we see Patzicia's major and Professor Humberto Xicay, the Foundation's Regional Director. That was all accomplished in 2005. Then in 2006 we cooperated with the municipal mayor and the village to cement the school's play yard, which previously was another cause for continual health problems--dusty and dirty when it was dry and hot, and muddy and dirty during the raining season. With the cemented courtyard and playground the children had a clean place to play. There has been no more need of emergency medical treatment of the children. 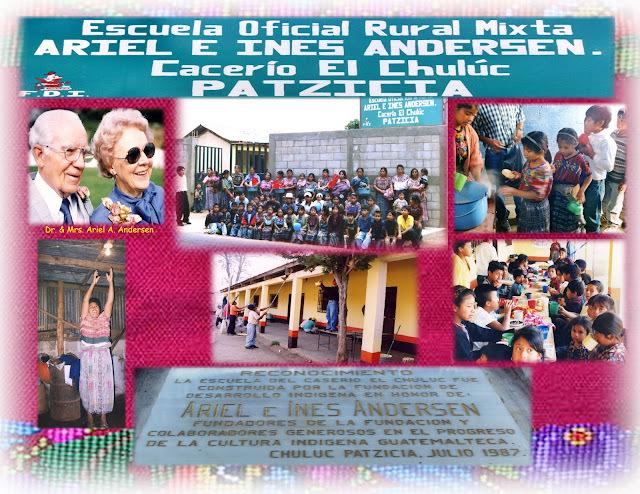 Now, the Foundation is working towards an increase in donations to make possible helping the 6th grade graduates continue their education in nearby Patzicia. No one from the village has ever been able to study past elementary school. In December 2006, the miracle of cell phones made possible the village leader, don Maximo, calling the U.S. from his village to thank the Foundation for the wonderful developments in his village over the previous 21 years. In May, don Maximo you see above on the left, gave a special lunch for Guatemalan Foundation representatives to thank the Foundation for all that has been done to revolutionize his village, and ask our help for a scholarship program so that one day soon his humble little village will be able to produce some teachers, and other productive Guatemalans, and bring the kind of prosperity needed to be able to solve their own problems. The mothers of the Chuluc Village are now happy and hopeful for a better future for them and their children, thanks to Ariel and Ines Andersen, and the many hundreds of generous Foundation donors that have made all this possible. It has been followed out with possible factors and evident stats and has also created more of the sense among the local people and among the writers to influence and change their level of Education. There is possibly a lot has been emphasized out here and hopefully for the future would give students all those possible provisions.